Each guitar pick made of wood has its own unique properties and signature sound as a result of differences in density, hardness and wood cell structure. Wood picks produce a warmer tone. 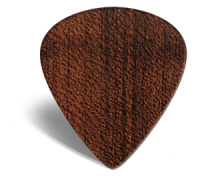 It’s been said that only the hardest woods are used for guitar picks, however, what we found out in our research and intensive testing, is that wood with long fibers, not necessarily the hardest wood, was ideal for guitar picks. The reason being the more you play and the harder you play, the long wood fibers are “packed” near the tip and hardens the picking surface naturally. Some harder woods tend to wear faster because the wood is actually worn off. The sometimes thick edge of a wood pick may create a fair amount of drag at first, but wood picks are generally easy to break in and may even do so quicker than plastic picks. After a couple hundred strokes, the metal guitar strings wear down the edge and create a smoother pass. One-Piece wood picks handcrafted from selected Oak, Ash, Blood Beech & Kebony Maple. Available in all eight shapes Milrid, Myrthild, Sønni, Sollin, Ågåt, Hedda, Olin & Peroline. 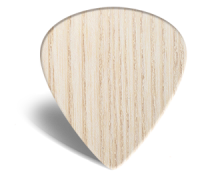 Three-Piece laminated wood picks built with a core choice of Oak, Ash, Blood Beech or Kebony Maple can be ordered in The Custom Shop. Blood beech produces a warm tone and wears slow. It has volume and punch. The density of the wood eliminates the feel of the strings hitting the pick between your fingertips, even on thinner picks. Brilliant for electric guitar. Thinner versions work nicely on acoustic, warm with punchy. Oak is bright in tone, high in volume, punchy and feels superb between the finger due to the long wood grain. Ages beautifully. Excellent for electric guitar. It might be a bit bright for acoustic, but there are those who desire exactly that. Definitely a loud pick. Kebony is a completelt dead material. Injected maple. The invention of the Kebonization process is a Norwegian story 20 years in the making. Kebony is a sustainable alternative to hardwoods from tropical regions. The processed maple resembles teak and other tropical varieties of wood. Kebony Maple produces a brighter tone than Ash or Beech. It wears quick, but has beautiful feel and tone. For a bedroom guitar player these picks will last for months. For a professional guitarist they might last only one show of rough playing. Less aggressive playing styles can enjoy this pick for 20-30 hours. Kebony Maple has a crisp tone on electric, but works well on acoustic. The tone is brighter than blood beech, but not as crisp as Kebony Maple. This wood is excellent for acoustic guitar, both steel and nylon strings. Fruit trees are known for their hard, dense wood. We get our apple wood from Ringsaker Fruit Garden near Hønefoss. They are kind enough to let us pick from the pile when they cut down rows of trees. Apple is by far one of our favourite woods. It sounds so excellent. It feels so good. And it looks so beautiful. Wears slow and ages beautifully. Combined with Silver, Copper or Brass in the Custom Shop and it might just be the ultimate guitar pick. The tone is warm, not as bright as Oak, but it speaks well. Plays excellent on both electric and acoustic.